Russian court-physician; born at Nikolaiev, government of Kherson, in 1835. He received his early education at the gymnasium of Odessa, whence he was graduated in 1849; studied at the Richelieu Lyceum in Odessa, at the University of Kharkov, and then at the University of Dorpat, from the latter of which he graduated in 1857 with the degree of doctor of medicine. In 1859 he was appointed physician of the city hospital at Vitebsk. He went abroad in 1861 and attended the lectures of Virchow, Traube, Skoda, and Helmholtz. In 1862 he became attached to the medical department of the Ministry of the Interior, and soon after was appointed a member of the St. Petersburg board of health. He assumed the editorship of the "Arkhiv Sudebnoi Meditziny Obshchestvennoi Higieny" in 1865. The municipal government of St. Petersburg entrusted him, in the following year, with the management of the Cholera Asylum, which in 1867 was transformed into the First City Hospital. To his efforts were due the establishment of a field-hospital and a training-school for medical assistants. Bertensohn is still director of these institutions, the first of their kind in Russia. In 1875 he established a free dispensary, which was named in honor of Grand Duchess Maria Alexandrovna. During the Franco-Prussian war he accompanied the celebrated surgeon Pirogov to the battle-field. From there he sent a series of valuable articles on military hygiene. He is a privy-councilor, an honorary physician to the Russian court, a member of many learned societies, and an honorary member of the medical associations of Vitebsk, Kiev, and St. Petersburg. His works on various questions of public hygiene and sanitary reform have been of great practical importance. Bertensohn was one of the most ardent propagators of Pirogov's advanced ideas and has done a great deal toward their realization. 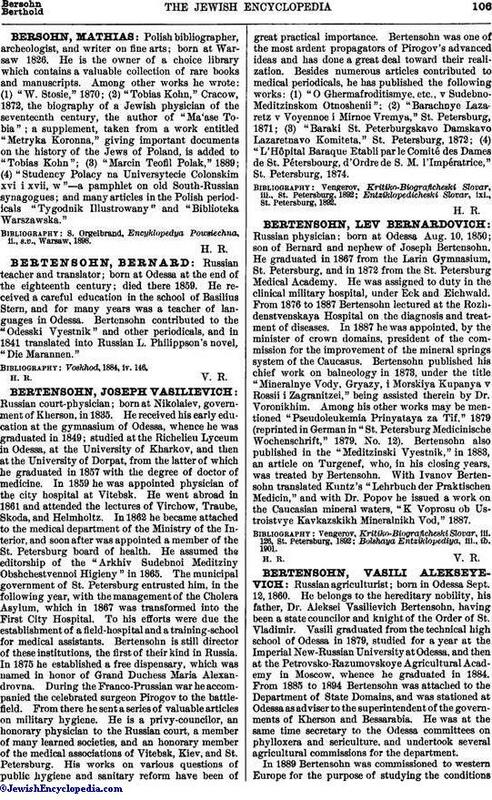 Besides numerous articles contributed to medical periodicals, he has published the following works: (1) "O Ghermafroditismye, etc., v Sudebno-Meditzinskom Otnoshenii"; (2) "Barachnye Lazaretz v Voyennoe i Mirnoe Vremya," St. Petersburg, 1871; (3) "Baraki St. Peterburgskavo Damskavo Lazaretnavo Komiteta," St. Petersburg, 1872; (4) "L'Hôpital Baraque Etabli par le Comité des Dames de St. Pétersbourg, d'Ordre de S. M. l'Impératrice," St. Petersburg, 1874. Entziklopedicheski Slovar, ixi., St. Petersburg, 1892.